Secretary to Cross River State Government, Martina Agbor, was on Monday held hostage by street sweepers and gardeners at the Calabar Urban Development Authority (CUDA) for a brief period, when she went to take inventory of the authority’s vehicles and other facilities. 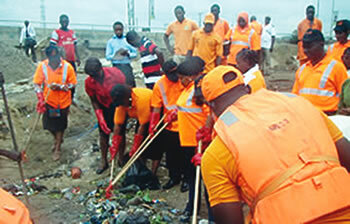 Agbor’s intention was to get details of the capacity of the authority to clean up the state capital which in recent times had been taken over by refuse dumps, Vanguard reports. However, after she was done inspecting the facilities, workers in the agency, numbering about 500, surrounded her, saying she must not leave until their outstanding 7 month salaries were paid. According to reports, she was held hostage until police came and rescued her from the premises. Reacting to the incident, Agbor said he government was not owing the workers, but the contractors handling the evacuation of refuse in the state capital. “They are saying that government owes them and I ask, owe you, how? Look at the books, they have over 200 workers and yet the town is still dirty. What do we owe them for? Who are those that have been working? That was what brought me here,” she said.